ON APRIL 4TH, 2009 AT THE "TOYOTA CENTER" IN HOUSTON,TEXAS THE WWE HALL OF FAME INDUCTION CEREMONY WILL BE HELD AND IT HAS BEEN ANNOUNCED THAT THE FIRST MEMBER IN THE 2009 HALL OF FAME WILL BE THE "TEXAS RATTLESNAKE" "STONE COLD" STEVE AUSTIN. THIS NEWS MAKES ME AND MY GOOD BUDDY "ICEMAN" VERY HAPPY, THERE IS NO DOUBT THAT "STONE COLD" DESERVES THIS HONOR. WHEN THE QUESTION WAS RAISED OF "WHO SHOULD INDUCT AUSTIN" MOST PEOPLE THOUGHT THAT STONE COLD'S GOOD FRIEND JIM ROSS (GOOD OLE JR) WOULD BE THE ONE TO INDUCT HIM INTO THE HALL OF FAME. STEVE AUSTIN HAS OTHER PLANS THOUGH BECAUSE IT HAS BEEN REPORTED THAT HE HAS REQUESTED AND PUSHED FOR THE "NATURE BOY" RIC FLAIR TO INDUCT HIM INSTEAD. IT IS WIDELY KNOWN THAT AUSTIN RESPECTS AND IDOLIZES THE "NATURE BOY" AND THIS REQUEST HE HAS SENT OUT TO WWE PROVES THIS TO BE TRUE. NOW THE BIG QUESTION IS GOING TO BE IF WWE AND VINCE MCMAHON GIVES AUSTIN WHAT HE WANTS, IN MY OWN PERSONAL OPINION IF RIC WAS STILL IN WWE I KNOW AUSTIN WOULD GET HIS WISH BUT NOW THAT RIC IS NOT ON THE WWE ROSTER IT MAKES THINGS A LITTLE MORE DIFFICULT. 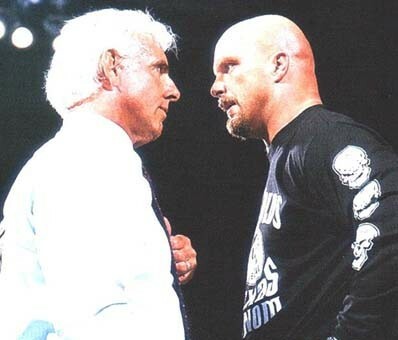 I THINK THAT IF MCMAHON RESPECTS STEVE AUSTIN LIKE HE SAYS HE DOES THEN HE WILL APPROVE OF RIC FLAIR TO MAKE THE TRIP TO HOUSTON,TEXAS TO INDUCT THE "TEXAS RATTLESNAKE" INTO THE HALL OF FAME. FOR ONE NIGHT VINCE SHOULD FORGET THAT RIC DON'T WORK FOR WWE AND FULLFILL "STONE COLD" STEVE AUSTIN'S REQUEST.